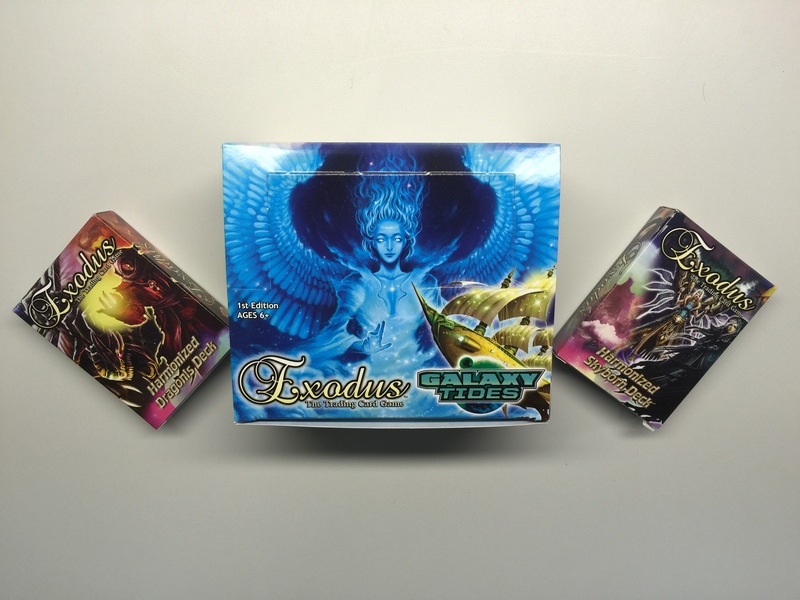 The folks over at Existence Games sent over two starter decks — the Harmonized Dragonis and Harmonized Skyborn decks (Dragons and Angels, respectively) — and a booster box of Exodus’ first expansion, Galaxy Tides. 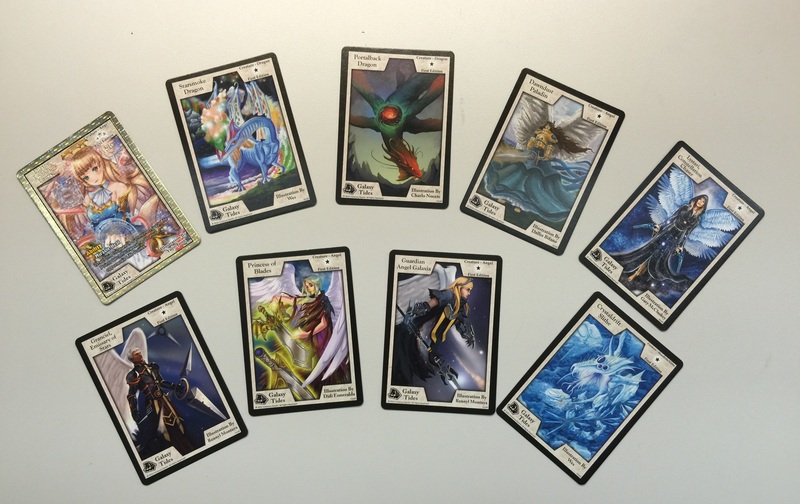 An Exodus deck is made up of Creature cards, Symmetry cards, and Energy cards. 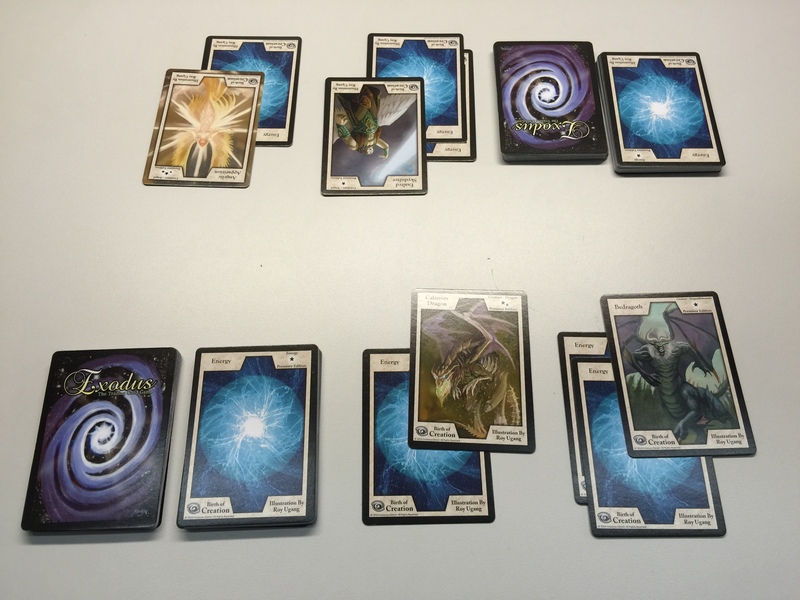 The basics of the game are that two or more players will summon creatures from their deck to battle against the opponents, using Symmetry cards to cause different effects along the way. The last person standing will win. 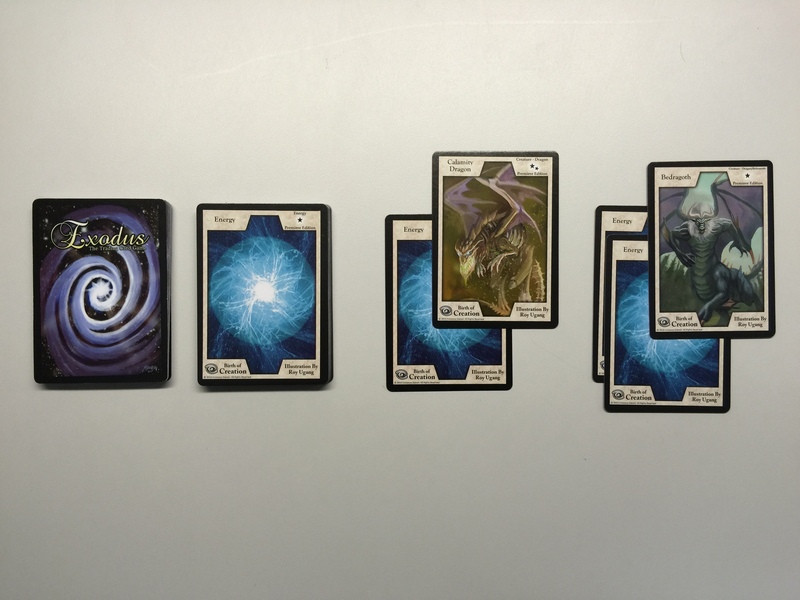 Unlike other trading card games, Exodus promises games that last only five minutes. These quick, straight-forward games are accomplished through simplistic rules anyone can pick up. Each player starts with 10 Life Points. Before play begins, players divide their decks into a face-up Energy Deck and the rest of the cards (Creatures and Symmetry) are shuffled and place face down as the Main Deck. Then, on their turn, players go through the five phases of the game: Draw, Energy, Creature, Attack, and End. 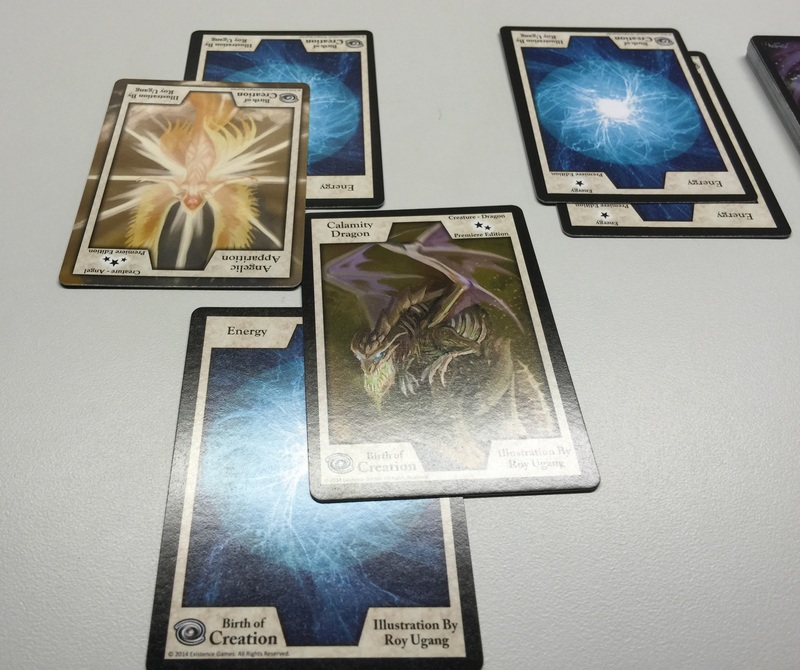 During the Draw Phase, a player draws (shocking, I know) three Energy cards, and three cards from the Main Deck. Then, Energy is played to the board in piles as they see fit during the Energy Phase. The piles and how many Energy cards you place into them are important, as you’ll discover in a couple of sentences from now. Energy is used to summon Creatures in to play during the, all together now, Creature Phase. Creature cards in Exodus do not have predefined power or toughness. 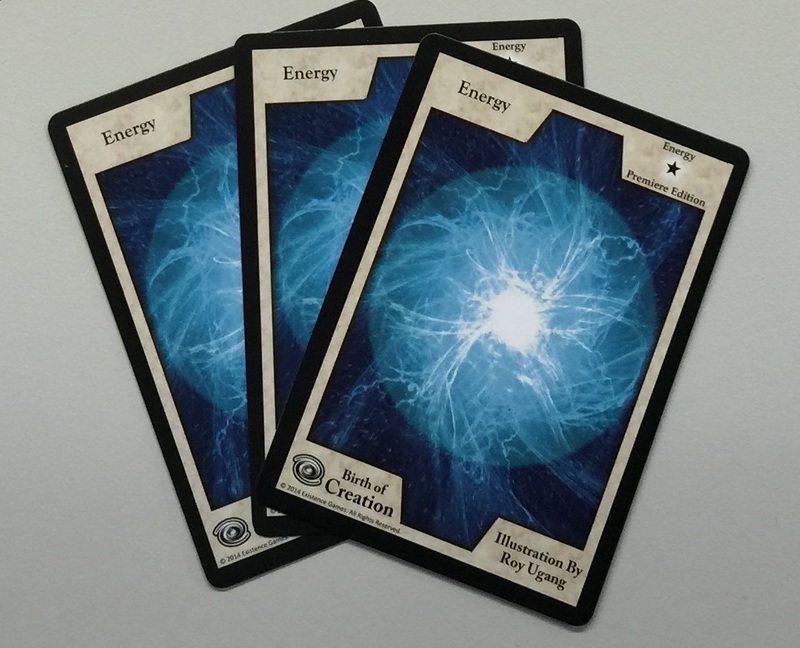 Instead, the number of Energy Cards assigned to a Creature dictates its power. So, this is where those Energy piles become important. To put it in Magic terms, every creature is X/X, where X equals the number of Energy cards assigned to it. 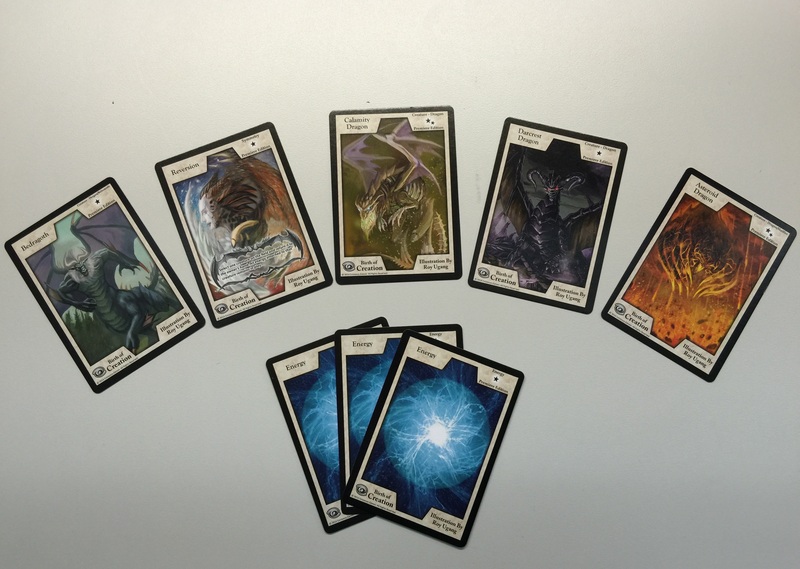 For example, a player has three Energy, two Creatures (Calamity Dragon and Bedragoth) and a Symmetry card (Reversion) in hand. Two Energy are put into a pile, with a single Energy into another. Calamity Dragon is played onto the single Energy (giving it a power of 1), and Bedragoth goes on the other pile (giving it a power of 2). And there you go. The Symmetry cards I mentioned earlier can be played at any time, but for the sake of continuing my example play scenario, we’ll talk about using one now. These cards have no cost associated with them. They are just put into play when you want them to be. 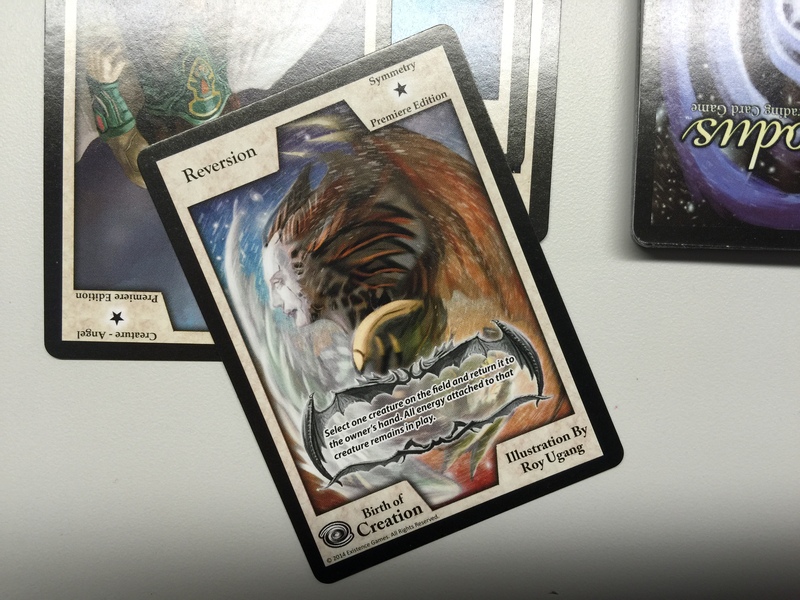 Going back to the example hand drawn, the player puts out the final card in hand, Reversion, which reads, “Select one creature on the field and return it to the owner’s hand. All energy attached to that creature remains in play.” The opponent’s Exalted Skyshifter is selected, and it goes back in hand, with its Energy remaining in play to be used during the opponent’s Creature Phase. Now we get to the Attack Phase. Here, the current player chooses what to attack with (or not attack with). So, if we turn our attention back to our example board, the Calamity Dragon and Bedragoth are ready to attack. After Reversion’s effect, the opponent only has Angelic Apparition left in play with 1 energy, so the Calamity Dragon is sent in to attack the Apparition. Both creatures have 1 Energy, so that amount is subtracted from each Creature’s Energy pile at the same time and returned to the Energy Deck. Because they are left with 0 Energy, both creatures go to the graveyard. Now, Bedragoth is free to attack the opponent with his 2 Energy, decreasing the opponents Life Points by 2. Once attacking is complete, the End Phase is nigh. This is where the current player says, “I end my turn.” During our play session, I accepted nothing less than that exact quote. Usually, my opponent just stared at me, saying, “You know I can’t do anything else. Just take your turn.” And I would continue to wait. This became a game in of itself where only I had fun… but fun is fun! Players continue through the phases until one person remains, crowning the winner! The two starters are very straight forward. Creatures have no abilities to speak of, so only the Energy assigned to them matters. This leaves game affecting abilities to the Symmetry cards. Overall, tactics are fairly limited in the starters. However, the Galaxy Tides expansion does introduce creatures with abilities, such as the Legendary Blade Luhzarus that states “You may pay 1 energy from this creature. If you do, it may conduct a second attack during your turn.” Other abilities actually single out specific creature types, making theme deck combos a possibility. If you think Exodus sounds fairly simple, you’re not wrong. But that’s how Existence wanted it. It is a game made by young designers for all ages. 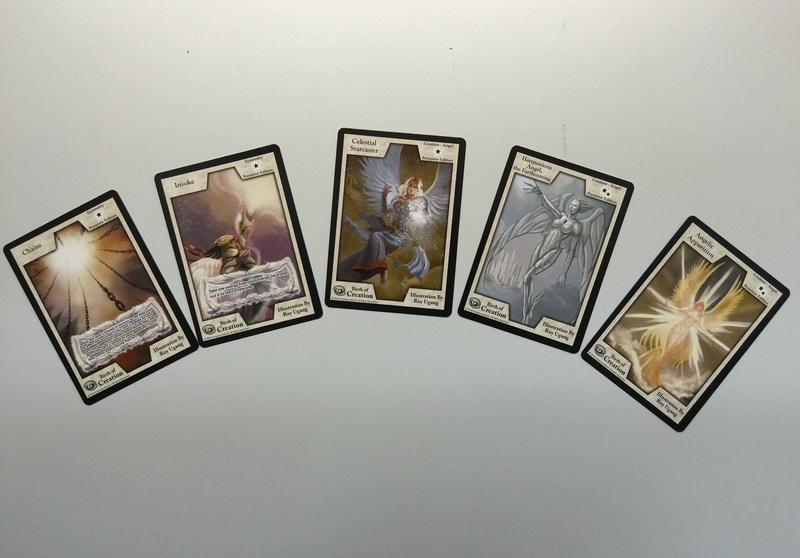 If you’re an experienced TCG player, I don’t think you’ll find anything in Exodus particularly exciting. However, a person looking for an introductory card game for a young child, may want to give it a look. Attractive card art and simple rules make it very welcoming to the younger audience. It will also help foster basic reading and mathematics skills, which we can all get behind! If you’re interested in checking the game out, visit your local game store or head over to the Exodus website.